The Tisch Scholars is a unique leadership development program that combines academic coursework, fieldwork in local communities, skill-building, and critical reflection. Scholars acquire the values, knowledge, and skills they need to address pressing social issues and effect meaningful change while building a supportive community to strengthen civic engagement at Tufts University and beyond. Current first-years and sophomores are welcome to apply, though the Scholars program is designed to have the strongest impact on students who participate for the full three years. Students apply for the program in early Spring, and accepted Scholars participate in a May retreat. Beginning in the Fall term, first-year Scholars take a yearlong Fieldwork Seminar while engaging in a community service or research project with a local partner organization. As they advance through the program in subsequent years, continuing Scholars strengthen their leadership skills and build capacity in local communities and on campus by taking on projects of greater complexity and responsibility. Third-year Scholars will develop a culminating capstone project. Explore some previous years' Tisch Scholar projects. Want to learn more about the program? Join us for one of these info sessions. All will be held in the Rabb Room at Tisch College—pizza provided! Monday, 12/3 at 4:30 p.m. In their first year of participation in the program—regardless of at what point in their academic career they joined—Tisch Scholars engage in a full-year experience that combines a practicum in a community site and rigorous academic coursework. In the Fall, Scholars will perform 8 hours per week of fieldwork and take a full-length, for-credit course. The course will provide students with a framework to critically analyze the root causes of social issues, and will allow Scholars to develop skills to take action for positive social change in community settings. In the Spring, Scholars will perform 8 hours per week of fieldwork and take a for-credit academic seminar. The seminar will allow students to critically reflect on the service-learning work they are engaged in at their partner sites, and share ideas on how to address social issues in the community. In their second and/or third year of participation in the program, Scholars may continue at the same community partner site, taking on a greater degree of responsibility, or elect to work with a new partner. Scholars who choose to study abroad will have the option to work with Tisch College staff to develop a community project that allows them to remain engaged with the Scholars program during their time away from campus. Before their first year in the program, newly selected scholars will participate in a Spring retreat (directly after finals) to give them a clear vision of what the program entails and how they can support each other as they engage in service-learning work. After the first year, returning Scholars will meet every other week to engage in dialogue about their work in community sites. Students will meet in small groups comprised of second- and third-year Scholars to reflect on their work. Additionally, each Fall, all Scholars (new and returning) will be required to attend a retreat to build community and welcome the new cohort of Scholars. All Scholars will be expected to attend skill-building workshops and social events each semester. Focused on areas such as community organizing, public speaking, resume-building, networking, and political engagement, the workshops will give Scholars tools to succeed at Tufts, in their community work, and in their future careers. Social events will help build a strong, cohesive, and supportive Scholar community. Returning scholars will play an integral role in designing and implementing these workshops and events. Students in their third and final year of the Tisch Scholars program will develop a Capstone project that will be showcased at a public event in the Spring. The Capstone can be developed in collaboration with a community partner or developed as thesis research with a faculty advisor, and students will receive course credit for their work on this project. For more information contact Sara Allred, Scholars Program Administrator, at sara.allred@tufts.edu. The 2019 application period for the Tisch Scholars program has closed. 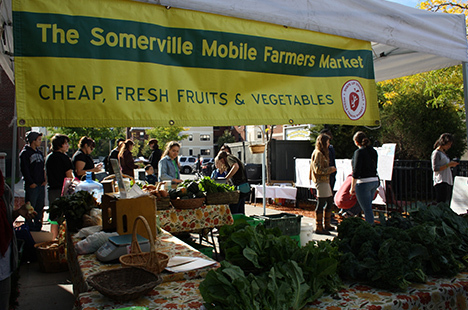 Through their individual projects, four Tisch Scholars form an integral part of a network of organizations within Somerville’s food economy that are fighting to create a healthier and more sustainable city.